Filomena Colaciello first appears at Painesville, Lake County, Ohio, in 1963. Filomena and her husband, Giuseppe Tomba, moved to Painesville, Ohio, from West Virginia in 1963. In America Filomena Colaciello was known by her married name Philomena Tomba. Filomena Colaciello, daughter of Nicola Maria Colaciello and Maria Teresa Colaneri, was born on November 2, 1899, at Frosolone, Isernia Province, Molise, Italy. She was baptized on November 2, 1899 at Frosolone, Italy. Filomena married Giuseppe Tomba, son of Cosmo Tomba and Maria Assunta DiIorio, about 1920, at Frosolone, Italy. 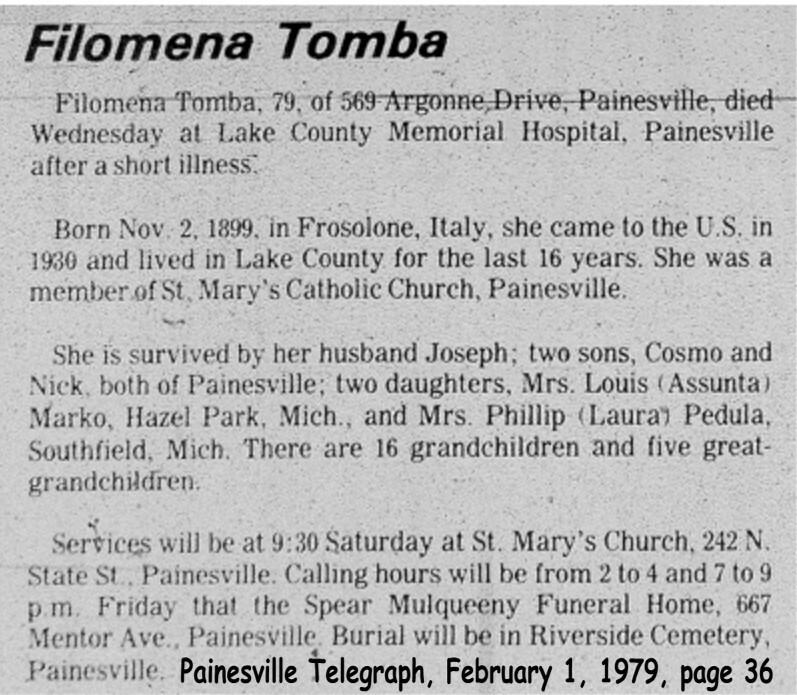 Filomena Colaciello died on January 31, 1979, at Lake County Memorial Hospital, Painesville, Lake County, Ohio. Her body was interred at Riverside Cemetery, Painesville, Lake County, Ohio. Filomena Colaciello immigrated to the United States on March 30, 1930, at age 30. She was travelling to Morgantown, Monongalia County, West Virginia. 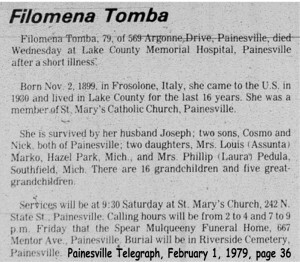 Filomena, and her children, Filomena Assunta Tomba and Cosmo Tomba, were joining the family’s father, Giuseppe Tomba, in West Virginia. They arrived in the United States at the Port of New York City aboard the ship SS Conte Biancamano. Filomena Colaciello was enumerated for the 1930 Census of the United States, in 1930, living at Westover, Monongalia County, West Virginia, as a sister-in-law of Nicola Tomba. Filomena Colaciello was enumerated as Filomi Tomba. Filomena Colaciello was enumerated for the 1940 Census of the United States, in 1940, living at Westover, Monongalia County, West Virginia, as a wife of Joseph Tomba. Filomena Colaciello was enumerated as Philomena Tomba. At the time of death, Filomena resided at 569 Argonne Drive, Painesville, Lake County, Ohio. 1. Filomena Assunta Tomba was born on September 9, 1921, at Frosolone, Isernia Province, Molise, Italy. Filomena married Louis Marco in 1946, at Monongalia County, West Virginia. 2. Cosmo Tomba was born about 1924, at Frosolone, Isernia Province, Molise, Italy. Cosmo married Nicolina Terriaca in 1952. 3. Nick J. was born on February 23, 1931, at Morgantown, Monongalia County, West Virginia. 4. Domenick Tomba was born on August 12, 1932, at Granville, Monongalia County, West Virginia, West Virginia. Domenick Tomba died on October 20, 1932, at Monongalia County, West Virginia. 5. Laura Tomba was born on August 30, 1934, at Morgantown, Monongalia County, West Virginia. Laura was married to Phillip Padula.